The agents were investigating a recent attack against a Christian government official. The bodies, which had stab wounds, were found in a hole near a Muslim extremist training site. A home-made explosive device exploded near a Protestant church. Jakarta (AsiaNews) - The city is back in the limelight for acts of violence and terror probably related to Muslim extremism, this after years of relative calm following a peace accord signed in 2001 by radical Muslim groups and Protestant Christian movements. In the past few days, the port city in central Sulawesi has been the scene of attacks against Christian-owned buildings. Two missing policemen, who were investigating one recent attack, were found yesterday, stabbed to death, their bodies hurriedly buried. The two officers, Andi Safa and Sudirman, were from Poso Pesisir Precinct. They went missing about a week ago and their bodies showed signs of stab wounds to the neck. Central Sulawesi Police Chief Brigadier General Dewa Parsana confirmed that the two men were on a special mission investigating a recent bombing against the home of Okri Mamuaya, a local Christian government official. The attack, which occurred on 9 October, caused material damage, but no one was hurt or killed. Investigators believe Muslim extremists were involved, trying to reignite sectarian tensions in the area. Early indications suggest that the two agents were on the way back to their station when they went missing. Their bodies were only found yesterday. 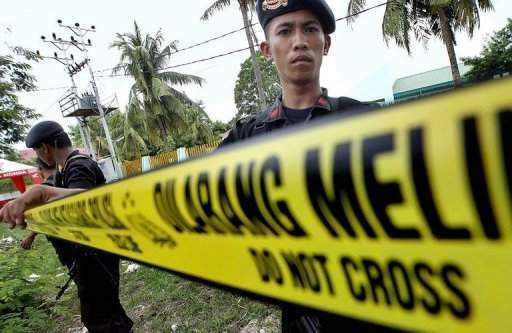 The murder occurred near the village of Masani, near Tamanjeka Forest, Poso Pesisir District, a popular training for paramilitary fighters associated with a radical Muslim group. For investigators, Jamaah Anshorut Tauhid (JAT) is behind the two men's death. Founded by Muslim leader Abu Bakar Baasyir, the radical group is now led by one Yasin. The 9 October attack against a local Christian official was followed by an explosion at a building near the Imanuel Taripa Protestant Church in East Pamona, Poso. Now law enforcement agencies fear that tensions might escalate and lead to open conflict between Muslims and Christians. Between 1999 and 2001, the Maluku Islands saw a bloody confrontation between Christians and Muslims. Thousands of people were killed and hundreds of churches and mosques were destroyed. Thousands of houses suffered the same fate. About half a million people were made homeless. Prompted by the central government, the two sides signed a truce in Malino, South Sulawesi, on 20 December 2001. The local population is evenly divided between Christians and Muslims. Still, episodes of terror have continued on and off with innocent people paying the price. In October 2005, three Christian girls on their way to school were decapitated by Muslim extremists, causing a sensation and outrage around the world.